A capable laptop that brings 3D to the mass market, but not without some significant drawbacks. Sitting at the top of the European laptop market, Acer is well known for offering high-quality laptops built around the latest technology, at truly competitive prices. As a result, it was no surprise to see Acer be the first to release a fully 3D-capable laptop to consumers in the form of the Acer Aspire 5738DZG – a 15.6-inch Intel and ATI-based multimedia machine that uses polarised screen technology to create a stunning 3D effect. 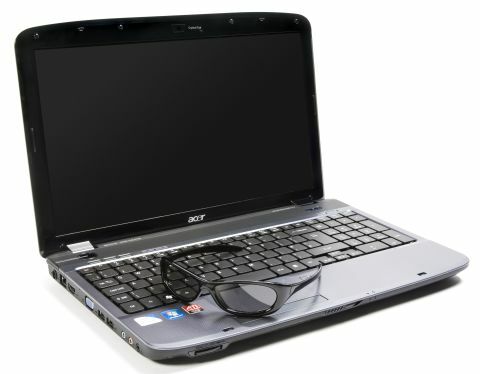 With such impressive rivals as the Asus G51, G53 and G73, and the Rock Xtreme 680 all currently available and built around Nvidia's far more powerful and more expensive 3D Vision technology, it was this use of a less capable, but far more affordable, polarised screen that always had the potential to be the Acer Aspire 5738DZG's Achilles heel, with far less gaming and movie content currently available and less powerful technology driving the overall 3D experience. So, with many big-name game developers and content creators backing Nvidia 3D Vision, how does the Acer Aspire 5738DZG measure up to its high-priced rivals and can it truly bring immersive 3D entertainment into the living room? Unfortunately the answer is not as cut and dried as we'd have liked, and while there's no doubt that the Aspire 5738DZG delivers a striking 3D effect at a great price, this is a laptop with as many flaws as it has benefits.